Do you remember putting your child in “time-out” when they needed a break from misbehavior? I decided sometimes we need a break from the stress of life and should have our own cozy time-out corner! The difference however, is that the latter corner is a reward to yourself! 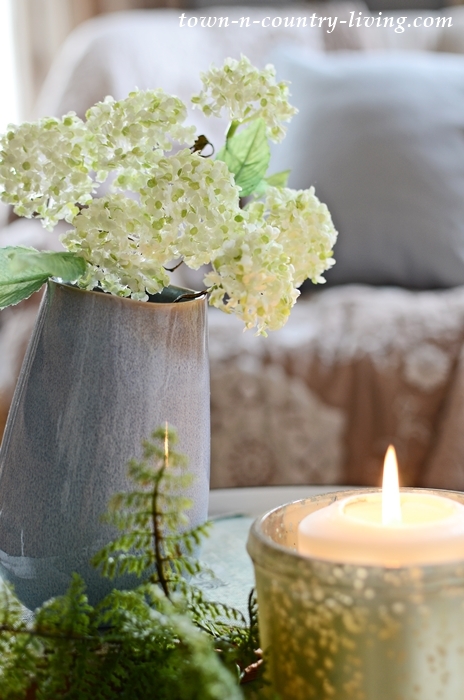 Today I’m joining a few blogging friends for another Cozy Living session. Check out everyone’s cozy ideas for April at the end of this post. Work is getting busy, our family events are getting more frequent, and soon there will be added work in the garden. In order to balance life, I created a cozy time-out corner just for me, when I need a respite from the world and simply want to relax. Since it’s spring, I lightened up my favorite chair with light weight quilt with a floral pattern. 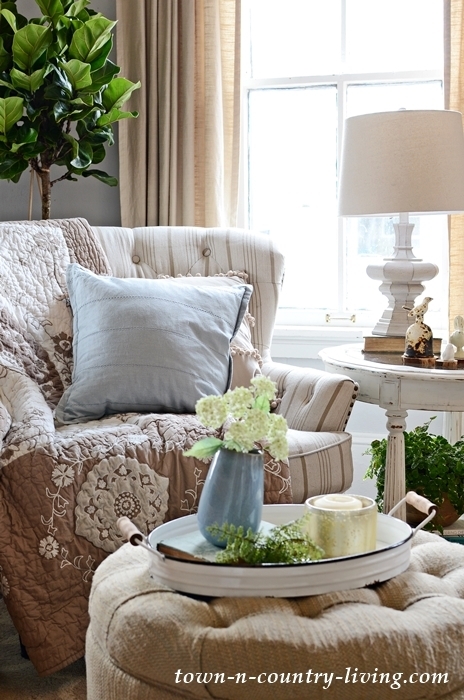 A pale blue pillow adds just a touch of calming corner. Here, I can sit and read or curl up to watch an episode or two of The Crown or reruns of Fixer Upper. A basket filled with my favorite magazines is nearby for inspiration. Ever since my early twenties I’ve loved poring over an issue of Country Home or Country Living, savoring every page and every photo. 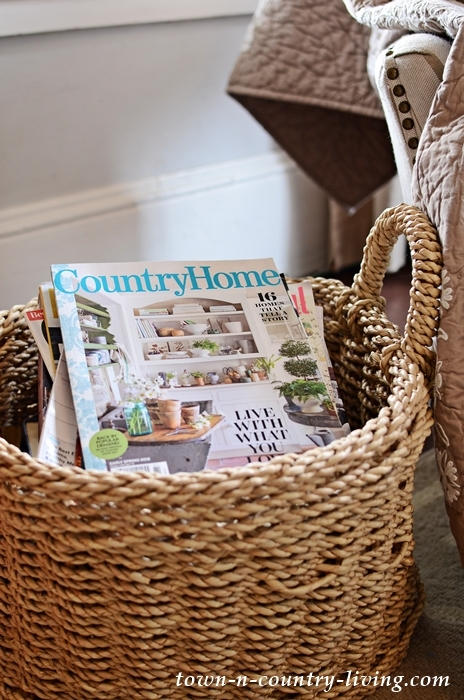 The latest issue of Country Home magazine is amazing and worth every penny! Also nearby is my favorite Creeping Fig to purify the air while I enjoy my time-out corner. 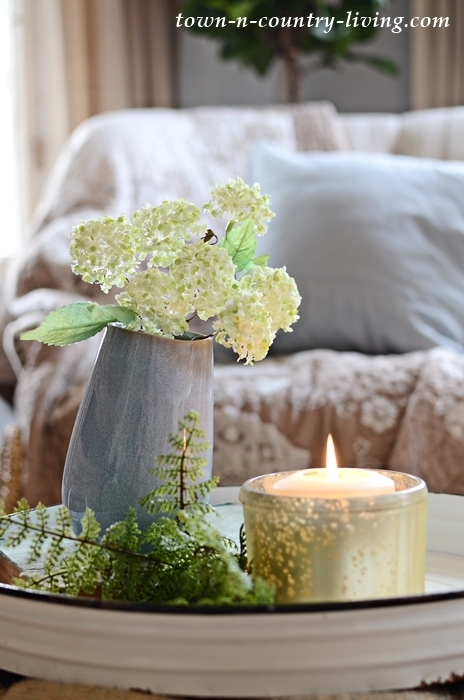 The glow of a mercury glass candle adds another layer of ambiance and warmth. Here, I will rest my weary bones and sore muscles after a fruitful day out in the garden. And did you notice my newest fig? It’s a smaller version of the popular fiddle leaf fig. 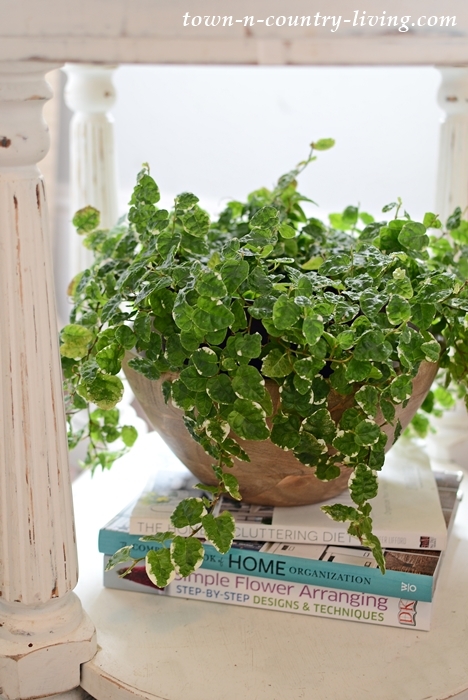 This charmer is called a “little fiddle.” Such a cute name for an impressive plant. Everyone deserves to take a time-out from the world on occasion, don’t you think? Visit my friends below to see what cozy ideas they have in store for April! Sincerely Marie Designs – Town and Country Living – Vinyet Etc. Subscribe to Town and Country Living via email and follow along on social sites! 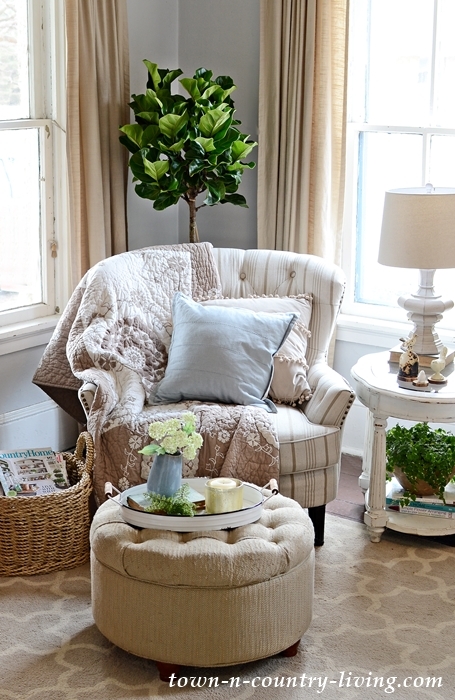 This is the perfect cozy corner to curl up! I get caught up in the fast lane some time. A pleasant corner is a very welcome thing to relax from the harried trails of life.. Your corner is sooo inviting. It would be hard to leave there to get back to “chores.” I hope you spend lots of timeouts there and enjoy every minute. I need to make myself a timeout corner sooner rather than later. Wonderful space! Is this in your living room? Is the big fig a low lighter? I loved Country Home magazine. I thought it was no longer in publication. Will rush and get a subscription now that you have shown me that it is. Thanks. Hi Beverley. I thought the same thing about Country Home and was excited to see it on the magazine rack in the store. I think they’re bringing it back as a quarterly publication. It’s my favorite magazine! Wonder if they sell the creeping fig plants here? Want one of those, yours is wonderful. It’s so dry here many plants just can’t handle it. Gets very hot in summer. Your cozy time out corner and chair look like heaven.I like to go lie down on our bed for while in afternoon sometimes.Love that gorgeous quilt on chair, did you make that? My daughter has sometimes found plants for sale on Etsy. You could try there to find the fig. The quilt is the Genevieve throw from Plow and Hearth. Sadly, it’s been discontinued. Jennifer, I love this idea! Everyone needs a little break from stress and life sometimes and what a perfect way to escape. I will def. be doing something similar in my house. That magazine basket is so cute and handy, love it! 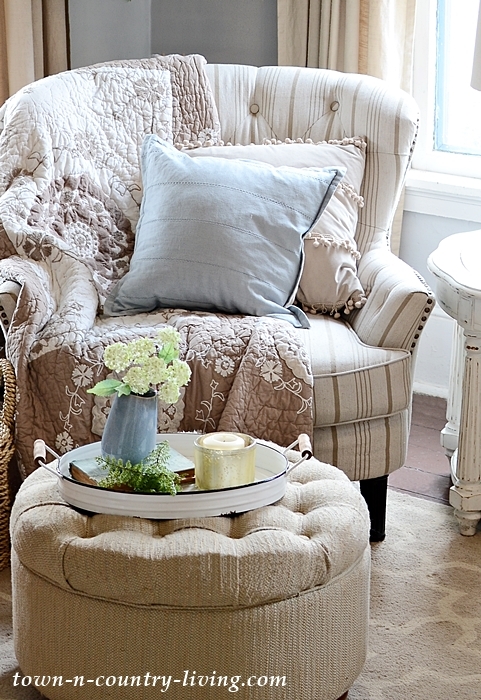 I love that chair and Ottoman! I don’t think I’ve looked at Country Home in a few years, I might have to take a look! Enjoy yourself in your special corner. Thanks, Nancy! My hubby keeps trying to take over my chair. 🙂 The latest issue of Country Home was fabulous! Love this post… and love the little fiddle! So pretty… looks just right in your little corner-of-the-world! I love your cozy corner Jennifer. I need to create this for myself. Thanks for the inspiration. That’s a very cozy corner indeed! Love it!